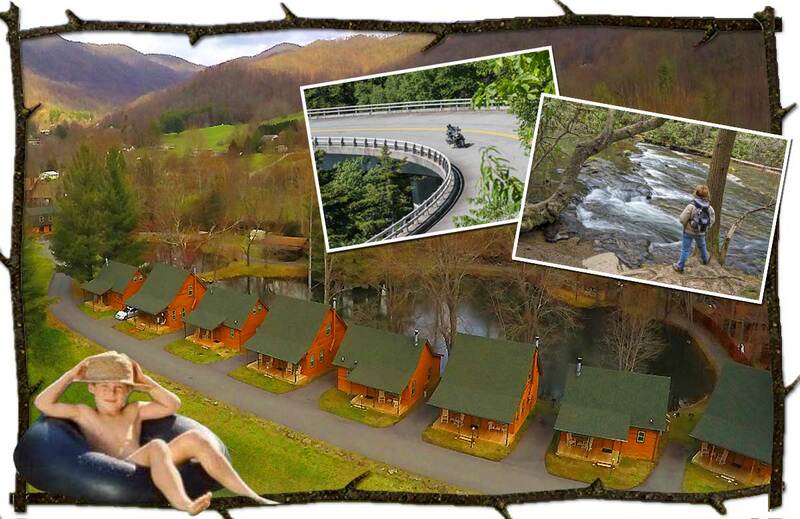 In the heart of Maggie Valley, North Carolina, yet in its own little corner of nature, the sound of the Jonathan Creek rushing by these Maggie Valley Cabins will remind you of the beauty of the Great Smoky Mountains that surround Maggie Valley. No big- city hectic lifestyle here, just tranquil atmosphere in a picturesque setting. Two and three bedroom cabins, comfortably appointed overlooking the ponds with decks and rocking chairs. The private fishing ponds, one stocked with Rainbow Trout, decorate the three and one-half acres of land. Jonathan Creek flows along one side of the property and is excellent for tubing. 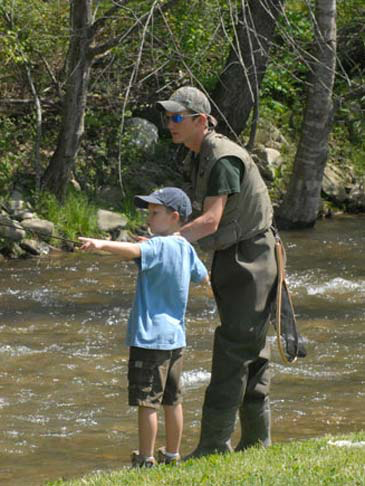 The creek is stocked by the state and a permit is required to fish. Close by the Maggie Valley rentals enjoy, The Blue Ridge Parkway, Great Smoky Mountains National Park with scenic drive and countless miles of trails to hike, waterfalls, streams, horseback riding, picnicking, whitewater rafting, antiquing, fine dining, Harah’s Cherokee Casino and the Cherokee Indian Reservation with history museums, shows and more. In the summer the days are temperate with highs rarely leaving the 80s while the evenings are cool in the 50s and 60s. There is even more great things to do close by. From the Biltmore Estate in Asheville 30 minutes east and the Great Smoky Mountains Railroad 30 minutes to the west, our Cabins are the great place to start your cabin rental plans. A lot of Maggie Valley cabin rentals are on-line today. The big vacation rental sites offer a wide variety of cabins for rent, but do you know what you are getting? Most home owners do not live in Maggie Valley or even in the state, so if you have a problem, your on your own. At Creekwood Village, we are on-site 24/7 and will do everything we can to make your stay a memorable one. We are members of all three Maggie Valley Business/Lodging Associations. Actively participating in events and volunteer where needed, and taking great pride in being involved with the hospitality industry. Come join us for the numerous festival and events right here at our doorstep at the Maggie Valley Festival Grounds. Events include a Hill Billy Jam, Car Shows, Craft Shows, Motorcycle Rallies, 4th of July Fireworks and more. Maggie is known for her southern hospitality, and we show that spirit to our guests. Make your trip to Maggie and Creekwood Village a yearly vacation destination and we'll make you feel right at home. 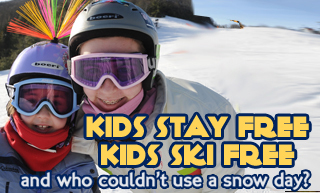 In the winter Cataloochee Ski Area challenges skiers of all skill levels. Moody Top at over 1 mile in elevation and Cataloochee’s ever improving ability to make snow as the temperatures drop, assure great skiing is close by. Tube World in the Valley is even closer to our rentals. Just at the end of the valley, you can experience the thrill of snow tubing. Plan a Christmas Tree Choose n’ Cut with in our maggie valley Cabin Rentals and Boyd Mountain Christmas Tree Farm.